Videos sold and are trendy on the Internet, I think it’s nothing new. That is why every day is more important for any business owning your own channel YouTube to generate and enhance from there visual content strategy. But do you know how to create and optimize your own YouTube channel? So in this post it is that I have the collaboration of Jason Aj , a professional with many years of experience in the audiovisual sector, to explain to us with great detail regarding the Google Video platform. How to create your first YouTube channel? Many readers of this post will think that creating videos is difficult, expensive and not worth facing social networks, but they are wrong, the video format is easy to perform, inexpensive and, of course, triumphs in social networks . A YouTube is up about 300 hours of video per minute, or what is the same, about 12 and a half days of content per minute. Impress is not it? Knowing that the company belongs to Google may think that video content are better positioned in the search results than other formats. In fact, YouTube is the second largest search engine behind Google and millions of young people have it in their home desktop, practically these young people are changing habits and spend watching television to watch videos on YouTube. I want to add that some of these young people earn much money uploading videos, they have become influencers on YouTube where drag thousands of followers and their opinion is valuable. These first data guide us to take positions when we want to start a video channel on YouTube. Record, edit and perform Video-marketing strategies can be critical for any company. Users are on social networks and through video format can attract them to our business. The platform has features and tools to motivate click with calls to action and send users to an external website. This page can be to our business and once the client is trying to sell our product there is an effective form of marketing. If you are a person interested in learning how to create and manage a channel on YouTube here you will find the way to do it. Throughout this post will show you some tips to start your life on the platform of biggest and most important in the world videos. To upload a video to YouTube account must be created in Google, the search engine has many tools and applications available to users: a Gmail account, with a hard cloud Drive, Google Maps, Translator and many more free apps available when you open an account. And among these tools it is also the option to create a YouTube channel to upload videos of our business. 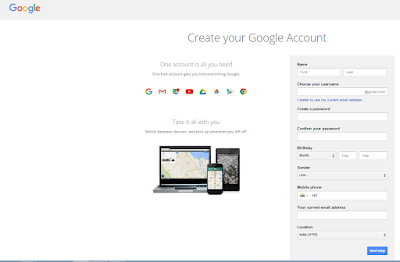 Then, open the web page of Google and see in the upper right of the login button. 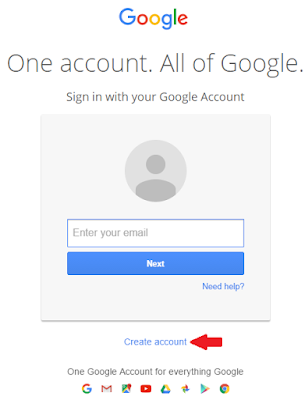 Click on it and you will enter the page where you can create the account or if you have already created where you can access mail and password. You must fill in the details you ask drawer, insert a name for your Gmail email and password.Accept privacy and conditions. From here you will be assigned a lot of applications (those mentioned above and many more), I propose a tour where we are sure you will be surprised. Among those applications you have assigned a channel on YouTube, empty, without images, poor content, but you will fill your imagination and creativity. 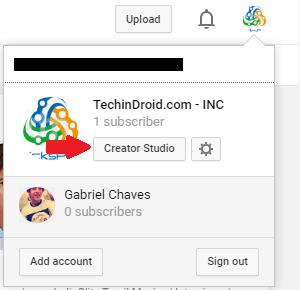 Enter your YouTube channel by clicking the icon. They appear one first proposals of videos with a menu on the left where you will access the different page that make up the channel. You must upload a photo / avatar that will appear in the top banner of your channel. The engine Google can recognize faces, so try uploading your avatar with a facial image. 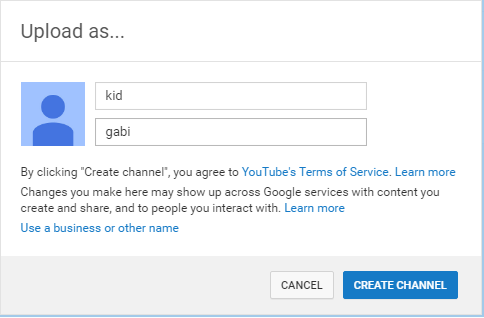 This is the initial appearance of your channel on YouTube and remember that is the image you will provide visitors, whether you’re a person or company. In your YouTube channel also offers you a host of powerful tools creation. Also, you can download free music copyright , edit parts of videos already uploaded, analyze traffic that appears on your channel, identify visitors by segmentation, annotate and cards in the same window video playback, manage a community followers, activate functions monetization of your videos, live streaming and perform more functions than you will discover. If you click on the avatar you have in the top right option open ” Creator Studio “ a configuration tool that will be essential in managing your channel. Beside you will see a gear that pressing will take you to the account settings. And created the possibility to upload a video to YouTube we will perform the action. 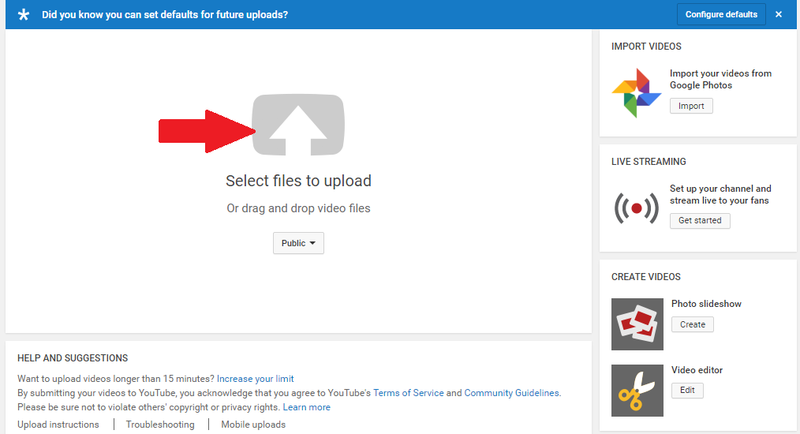 At the top you will see a button with the word “Upload” button clearly indicates that click on the option to upload a video to our channel will open. You have to specify the path where the video is hosted on your computer. 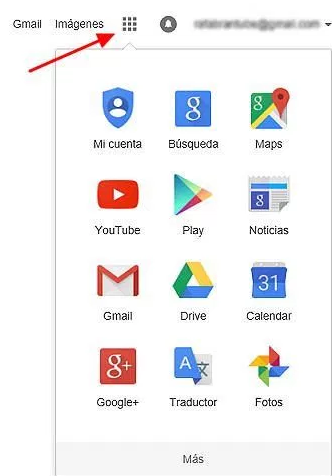 A page will appear where you have to enter all data accompanying the video, the YouTube algorithm can not read what is inside the video, the picture is blind to the platform, but the search engine can read and locate everything is around. We must fill all explanatory video data, from the title to the geographical location, this will help to show the video in search results on Google. 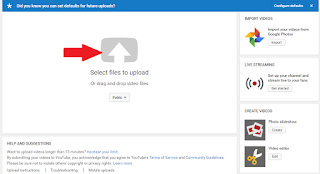 If the Internet connection is good that you have the video upload time low but if you have a Slow connection upload the video will slow down. It is essential to know the weight and video quality because longer heavier (this is measured in megabytes). Also the quality will be an important factor, YouTube loves HD (High Definition) , better positions the content in this format, and therefore we recommend recording, editing and rise in this quality. While you are uploading the video can go filling the descriptive fields, the title is the cornerstone, is where you describe what is visual content we are handling and has a factor of very high position, you have 60 characters and must use the keyword with which you want to place the video or if your goal is not position it you can place an identifying text. The description is the part where you can extend yourself explaining everything you want, have up to 800 words and can insert active outbound links are links to click on them, users can visit other web spaces. Take advantage of this space and develop all possible text, as I have said before YouTube is blind for images but not for text, this is what he understands, this text will be read by the spider Google and positioned next to the video. In the description of a video from YouTube it is about the same text to develop a post in a blog. The title is 80% of positioning the video! Although a good description with keywords also benefit us when we want to position labels better … and what they do is catalog the video. In the area of labeling we can insert up to 18 keywords and are generic terms that placed the video. Under the drawer labeling and while we are writing appear related words (existing suggestions), if we find one that interests us can place it . 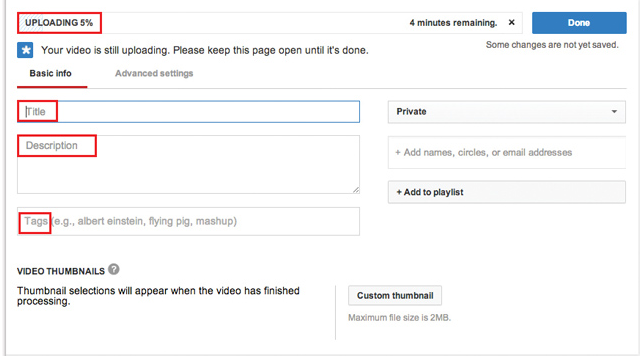 Once All upload process where finished You can Click Publish button to live your video on YouTube.